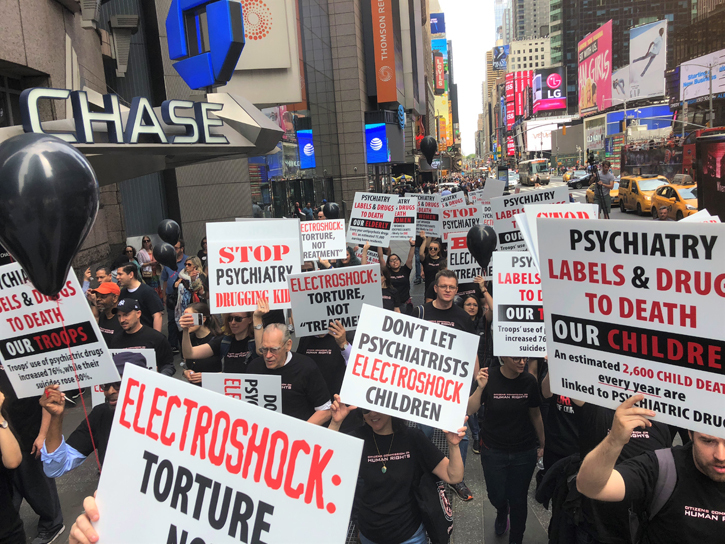 The mental health watchdog Citizens Commission on Human Rights (CCHR) New York protested psychiatry’s ongoing use of electroshock treatment (ECT), especially on toddlers and children when it marched on the annual conference of the American Psychiatric Association (APA) in New York on Saturday, May 5. While most Americans believe that ECT—the passage of up to 460 volts of electricity sent through the brain—stopped following the 1975 film, One Flew Over the Cuckoo’s Nest, CCHR says the more than 25 lectures or papers presented on electroshock at the APA convention this year puts such beliefs to rest. The U.S. manufacturers of electroshock devices were two of many psychiatric device and pharmaceutical companies exhibiting at the APA conference. The protest condemned electroshock as torture and called for it to be banned. CCHR’s international headquarters, based in Los Angeles, supported the protest and the need for a ban on all uses of electroshock. It said thousands of adult patients have condemned ECT as causing them brain damage and memory loss. Such physical abuse, if committed by anyone but a psychiatrist, it says, would constitute a crime, and when given to children should be meted the highest penalties. 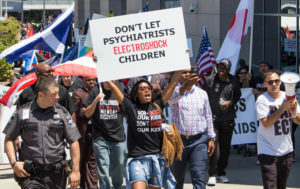 Through recent Freedom of Information Act requests filed with U.S. states, CCHR established what has been withheld from Americans for years—that children aged five and younger are being electroshocked. Autistic children are also undergoing it, despite the Food and Drug Administration (FDA) never approving ECT’s use for autism. One autistic teenager was electroshocked 260 times. As children cannot consent to this barbarity, CCHR says that based on a United Nations (UN) report, its use on children would constitute torture, adding further argument for its prohibition. Some media generate the idea that despite ECT being viewed as a “brain-damaging tool of torture with no place in modern medicine,” it “works.” However, no psychiatrist has been able to prove how brain-damaging a person does anything other than temporarily shift the person’s attention off what might be ailing him—too numb and in pain to remember. But based on many thousands of cases over decades that have either contacted CCHR or been publicly reported, their underlying problem returns and can worsen. Electroshock has no therapeutic value in as much as it doesn’t cure. In fact, it induces a grand mal seizure, a type of seizure that involves a loss of consciousness and violent muscle contractions, masked by an anesthetic. The FDA has never required manufacturers to conduct clinical studies that prove electroshock is either safe or effective, despite being used for more than 80 years. CCHR says that because a muscle relaxant and an anesthetic are used today to prevent bone fracture or to spare the patient the full effect of the electroshock violence impacting the body, or that ECT differs from its early years, electricity hasn’t changed. There’s no evidence that it is re-setting a “depressed” brain (or that the brain is even a source of depression)—in the way that a brief electroshock to a stopped heart may resuscitate it or reset its rhythm. ECT is not treating a physical abnormality or disease. Early results of children being given electroshock include a seven-year-old girl, following five sessions, becoming nearly catatonic and a six-year-old boy going from being shy to acting increasingly aggressive and violent. Today, nearly 12,000 people have signed CCHR’s online petition launched in 2017 supporting a ban on electroshock. CCHR is urging more concerned individuals to sign and let others know to sign the Petition to Ban Electroshock (ECT) Device Being Used on Children, the Elderly and Vulnerable Patients. Citizens Petition filed with FDA Commissioner, Aug. 2016, http://emord.com/blawg/wp-content/uploads/2016/08/1-ECT-Citizen-Petition.pdf. Thomas Insel, “Transforming Diagnosis,” NIMH Website, 20 Apr. 2013, http://www.nimh.nih.gov/about/director/2013/transforming-diagnosis.shtml. John Read, Chelsea Arnold, “Is Electroconvulsive Therapy for Depression More Effective Than Placebo? A Systematic Review of Studies Since 2009,” Ethical Human Psychology and Psychiatry Volume 19, Number 1, 2017, pp. 5-23(19), http://www.ingentaconnect.com/content/springer/ehpp/2017/00000019/00000001/art00002. Dr. Jeffrey S. Kaye and HP Albarelli Jr., “The Hidden Tragedy of the CIA’s Experiments on Children,” Truthout, 11 Aug 2010, http://truth-out.org/archive/component/k2/item/91211:the-hidden-tragedy-of-the-cias-experiments-on-children.